Deep Conditioning is a must for women who frequently style their hair, use chemical treatments or desire longer hair. However, with so many on the market, it can be hard to make a decision for which to try. This is one of the easiest Treatments to use at home or in the salon. It is fool-proof, but proved to deliver the results you need if your hair is thirsty for Hydration. This product is a great hair food to add to your diet. You can use it up to 2-3 times per week. This is important as many conditioners would do more damage to your hair if you were to use it that often. There are two versions of this mask. If you have fine hair you would want to use the weightless mask and if you have thick hair you should use the regular Hydration Mask. 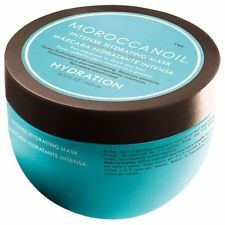 This mask can be purchased at MoroccanOil Salons such as Pura Vida Salon and Spa of Abilene, TX or you can visit a Moroccan Oil Salon in your area to receive this product as a service. For added Conditioning you can add the Moroccan Oil Treatment to your hair. – They have made two options based on your hairtype. – NO HEAT REQUIRED YES!! – It is strong enough and gentle enough to give your hair the balance it needs. PLUS THE SCENT IS HEAVENLY! Take a look at the ingredients and determine if this is a product that you would like to add into your regime. It’s worth the look!